The Brooks Group is Named One of NYC’s Top 20 PR Firms for Second Year in a Row! 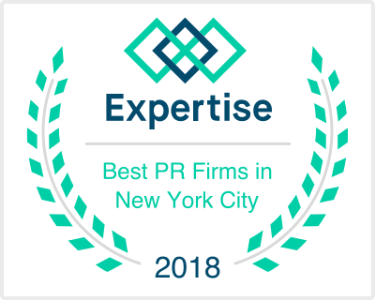 We are honored to receive this recognition out of the 2,050 PR firms located in New York. The top 20 were scored on more than 25 variables across five categories, including reputation, credibility, experience, availability and professionalism. At The Brooks Group we offer thoughtful counsel, comprehensive strategies, and results-oriented programs that drive both awareness and acclaim for our clients. We would not have achieved this success without our dedicated clients and hardworking team who love what they do. For more information about our services please click here and for the full list of winners from Expertise click here.